When is the Big Latch On? The Big Latch On event will take place on Saturday, August 5, 2017 from 8:30am-11am. The actual Big Latch On will take place at exactly 10:30am, so don’t be late! Where will the Big Latch On take place? At Wonderful and Wild. The address is: 1007 University Ave. San Diego,CA 92103. Do I need to RSVP for the Big Latch On Event? Yes, please! Since we need 1 non-breastfeeding witness for every 10 breastfeeding mamas, it would be wonderful if you can RSVP before the event. If you forget, please come anyway. What is the agenda for the Big Latch On? 8:30am-10:15am - Registration and mingle. Purchase tickets for our Opportunity Drawing; proceeds to be donated to the San Diego Breastfeeding Center Foundation. First 100 attendees will get an awesome Goodie Bag! 10:30am-10:31am - Big Latch On! What takes place at registration? Each breastfeeding mom needs to register, with her name and email address, so that she can be counted during the event. Also, each mom will decide whether she gives her permission to be photographed during the event. What takes place during the Big Latch On? 8:30am-10:15am: Once moms have registered, there will be plenty of time to relax, mingle, and grab some coffee and breakfast at many of the local restaurants in walking distance. You will also have time to purchase tickets for the opportunity drawing items. Definitely bring a water bottle so you can stay hydrated. From 10:30-10:31am, all of the participants will latch on their child(ren). Each breastfeeding mom will be counted by one of the non-breastfeeding witnesses so that she can be accounted for in setting the Big Latch On record. From 10:40-11:00am, opportunity drawing winners will be chosen. Winners must be present to receive the gift. What are the opportunity drawing details? We are in the process of collecting items for our opportunity drawing! Each Big Latch On participant will be given one ticket to enter the opportunity drawing. Additional tickets can be purchased at the event: $1 for 1 ticket, $5 for 6 tickets, $10 for 12 tickets. All money raised will be donated to the San Diego Breastfeeding Center Foundation to help pay for reduced-fee breastfeeding consultations for low-income breastfeeding families in San Diego. If you have an item or service that you would like to donate for the opportunity drawing, please contact Robin Kaplan, at robinkaplan@sdbfc.com. This year we are offering Sponsorship Opportunities, at a variety of levels, ranging from Goodie Bag donations to official sponsorship of our event. If you are interested in sharing your service or product with our local families, please contact our event coordinator, Liz Bradshaw at LizBradshaw@sdbfc.com for more sponsorship information. 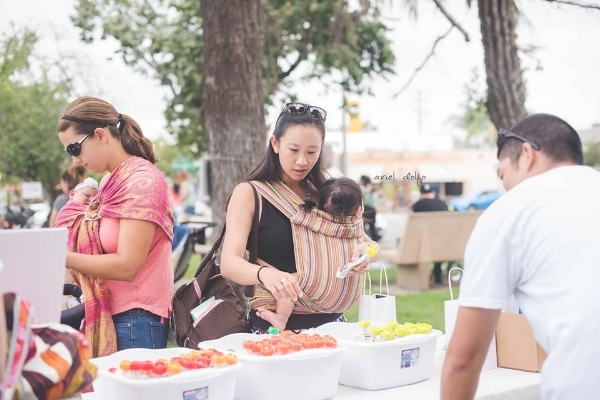 So far, we are thrilled to have the following businesses as sponsors: La Luna Health, San Diego County Breastfeeding Coalition, A Wholesome Home, Luludew, and Inspire Life Chiropractic. How will the photographs be used after the event? We are so thrilled that Ariel Dolfo, of Ariel Dolfo Photography, will be documenting our Big Latch On event for the fourth year in a row! Photographs will only be taken of mothers who give permission to be photographed. Group photos will be taken to document the event and sent with our final number of participating breastfeeding mothers, as well as placed on the San Diego Breastfeeding Center website. Older PostMeet SDBFC's Newest Lactation Consultant - Nicole Kreps!